The Nintendo rumor wheel is always turning, churning out seemingly credible rumblings of dream games day in and day out. And since Nintendo has said very little about any releases after January, these rumors are whirling with tornado-like frenzy. In honor of new year’s dreams, the left-field games Nintendo sometimes throws our way, and whispers of a sequel to this legendary game, I will be analyzing The Legend of Zelda: Link’s Awakening dungeon-by-dungeon. As I have The Legend of Zelda: Ocarina of Time, each entry in this series will focus on a particular dungeon, delving into the intricacies of various aspects of design. Because it adds color and an additional optional dungeon, I will be looking specifically at the 1998 re-release The Legend of Zelda: Link’s Awakening DX. 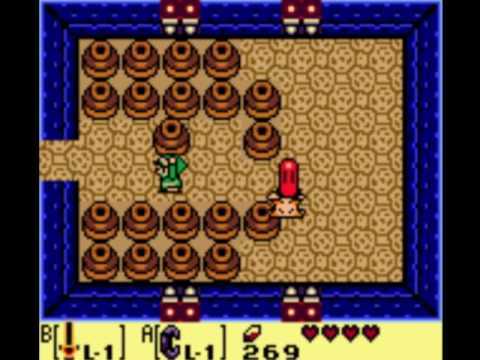 In this entry, I will be examining Link’s Awakening’s second dungeon, Bottle Grotto. After collecting the Full Moon Cello from Tail Cave, the owl tells Link to go north to Goponga Swamp, but along the way Link is accosted by kids warning of Moblins attacking the village, where it turns out they stole BowWow. After taking a northwest route through the Mysterious Forest in search of BowWow, Link runs across the entrance to the Moblin’s Hideout. 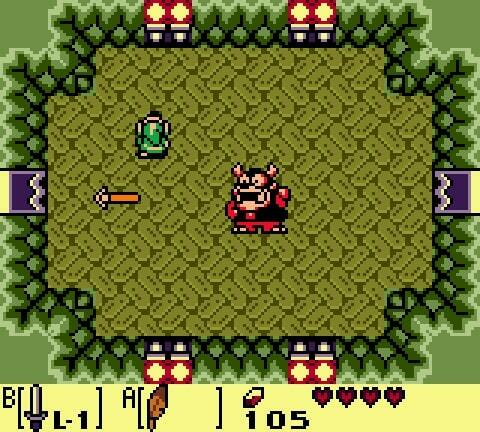 The Hideout is comprised of four rooms, one with a single Moblin, another with four, another with King Moblin, and a final room where Link finds BowWow. 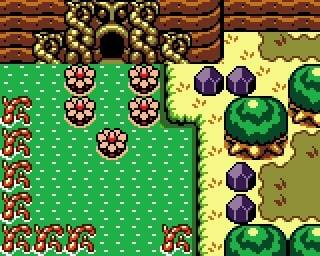 But before returning BowWow to its owner, Link has BowWow eat the Goponga Flowers in Goponga Swamp to gain entrance to Bottle Grotto. 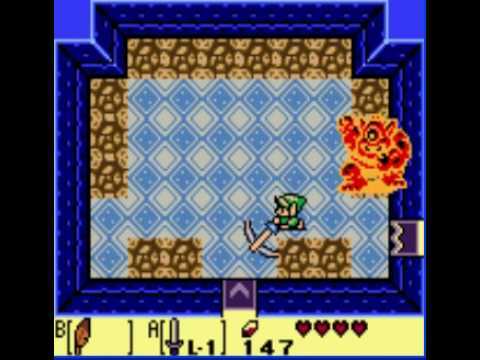 As a whole, this inter-dungeon sequence is one of the most well-directed in the game, as there isn’t much opportunity to get completely lost, and the way Link’s quest is interrupted by an emergency lends the situation a sense of organic urgency. Leaving BowWow outside, Link ventures into Bottle Grotto’s fitting first room: a room full of bottles. From here, most of the dungeon is a linear trip to the end, making for a dungeon less focused on navigational challenge than those challenges presented in each room. Fortunately, these challenges are generally far more inventive than those in Tail Cave, including switch puzzles that ask the player to consider the implications of their actions across rooms, a puzzle where the player must kill enemies in a particular order, a puzzle where the player pushes blocks to match a pattern on the floor, and a couple of puzzles-as-enemies that mirror your move. All in all, Bottle Grotto is comprised of an enjoyable collection of rooms, even if many are one-and-dones unrelated to the rest of the dungeon. While the dungeon’s linear bottle-shaped layout might get stale were other dungeons to repeat it, it is a counterpart to the game’s more labyrinthine dungeons, and it balances its difficulty through finely-tuned challenges rather than an abstruse layout or confusing game of lock-and-key. Unsurprisingly, Bottle Grotto’s main theme is bottles. It’s about as strange a theme as the “tails” of Tail Cave, but Bottle Grotto more effectively integrates its theme into its design. Along with the dungeon’s name and bottle-shaped topography, bottles are consistently present throughout the entire dungeon. Typically, they are used as either obstacles the player can’t bypass until discovering the Power Gloves or a way to attack a couple Pols Voices who are otherwise invincible. However, the sheer surplus of bottles in some rooms (like the dungeon’s entrance) lends them an additional aesthetic value, as they help establish a sense of place that differentiates this dungeon from the rest. Though not as as thorough an exploration of theme as Ocarina dungeons like the Shadow Temple or Spirit Temple, Bottle Grotto manages to integrate bottles into art, puzzles, platforming, and a boss battle more deeply with surprising acumen. These bottles come part and parcel with the dungeon’s item, the Power Bracelet. This bracelet allows Link to pick up these myriad bottles, hold them overhead, and throw them in the direction he is facing. This varied ability is used intelligently throughout the dungeon and overworld as a way to overcome obstacles and engage in combat, but it is notably less innovative and enjoyable than the jumping enabled by Roc’s Feather. Furthermore, the Power Bracelet underscores two of Link’s Awakening’s greatest annoyances: repetitive text boxes (which the player has to click through every time they touch a bottle without the Power Bracelet equipped) and switching out items. While future Zeldas would essentially ingrain the ability to lift heavy objects, Link’s Awakening asks the player equip the Power Bracelet every time they want to lift a heavy object, which gets very old very quickly. Despite these drawbacks, clever usage like the weight puzzle near the dungeon’s finish and consistent utility in both this dungeon and the overworld make the Power Bracelet an essential additional to Link’s arsenal. But then again, should Link really need his strength enhanced to lift a bottle? 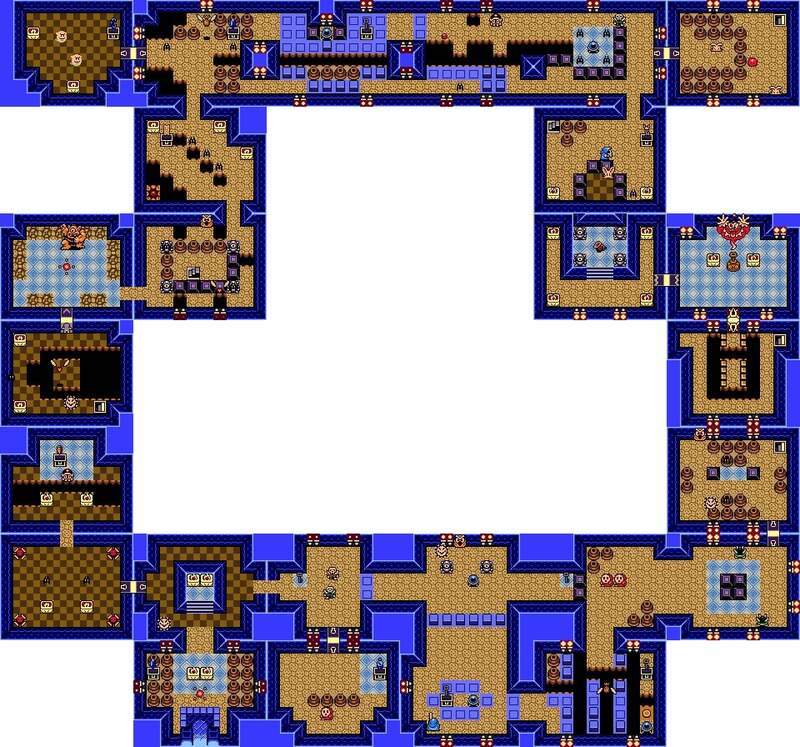 Bottle Grotto is home to thirteen enemies, eight of which appeared in Tail Cave (Blade Trap, Goomba, Hardhat Beetle, Keese, Spark, Spiked Beetle, Stalfos, and Zol). The remaining five are comprised of the aforementioned Vacuum Mouth obstacle, Pols Voice (a ghost that looks like a rabbit and can only be killed by thrown bottle), and three enemies borrowed from the Super Mario Bros. series. All five of these new enemies are standouts that ask the player to engage with them in a totally unique way. Boo Buddy, for example needs to be avoided until the player lights all the lamps in the room, and Mask-Mimic imitates Link’s movement. Piranha Plants simply performs the same role as in Super Mario Bros., but it’s still fun to see their cameo here since they’ll soon be playable in Super Smash Bros. Ultimate. Bottle Grove’s miniboss is the intimidating Hinox, a large one-eyed ogre that can drop bombs and toss Link across the room. Despite sounding tough, he is a push-over who would have been better suited to the theoretical one-eyed dungeon that Tail Cave’s first room should open. The dungeon’s final boss, Genie, is a… genie who lives in a bottle. Defeating his first form consists of clicking through text boxes, dodging a flame attack, and throwing his bottle against a wall. After his bottle breaks, he becomes more aggressive in his second phase, which lends a sense of climax to the fight. 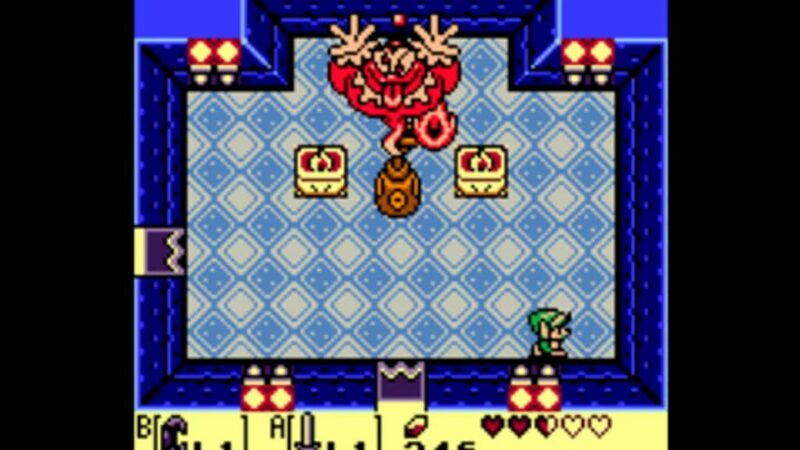 Though not too difficult or memorable, the battle against Genie is a clever way to incorporate both the dungeon’s theme and item into one final fight. For deep dives into other levels from Link’s Awakening, as well as levels from other classic Nintendo games such as Super Mario Odyssey and The Legend of Zelda: Ocarina of Time, click here.